New frame design! 250cc Engine! Fast, Reliable and powerful!! 250cc 4 Stroke Air-cooled Engine. Manual 5-Speed Transmission ---Quicker start and much more convenient! Pro`s Choice! DB-G011 has been bringing sheer excitement to the 250cc class. Notably for its remarkable performance in racing. The dirt bike launches out of the gates giving Honda and Kawasaki a run for their money, winning unofficial competition. This fantastic ride has turned heads in the 4 stroke community. The motors run cool and long with little needs for maintenance. The speed and raw power are exceptional and the shocks make for easy control through the bumps. Its competitors are left in the dust, dazed and confused. DB-G011 offers a 5 Speed, Manual transmission. It is not playing, but requiring real tactful rein. The engineer went on to the suspension and brakes. Both the rear suspension has been highly upgraded, which make Big jumps a breeze. As any rider would tell you, power is nothing without good brakes. DB-G011 again comes with class leading front and rear hydraulic disk brakes , which ensures strong, linear stopping power. Carton dimension (L*W*H/in) 71.3" x 16.9" x 37.8"
Shipping charge for one single unit of DB-G011 is $279.95(Please login to see real shipping charge for these states: Florida, New York, District of Columbia, Connecticut, Maine, Maryland, Massachusetts, Montana, New Hampshire, New Jersey, Pennsylvania, Rhode Island, Vermont, West Virginia, Delaware, etc.) , and you will get discounted shipping price if you order multiple item. Power Sports Max is Awesome! Their Service is fast and they are friendly. 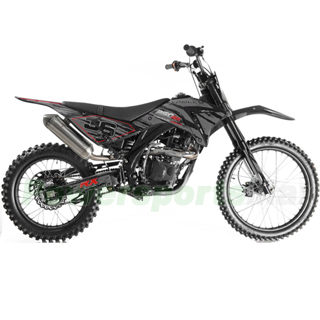 I just purchased 3 Dirt Bikes.. An Apollo DB-36 250rx, an Apollo DB-25 70cc, and a Tao DB-T013 110cc. All the bikes shipped super fast...Less than a week! They were crated and packed very well and had no damage at all. All the bikes assembled fairly easy, but do require a little mechanical ability. My Son and I assembled them together and it was a lot easier tackling the job with 2 people. I think it's good to do the assembly yourself anyway because you get to familiarize yourself with the bike before you ride it. All the bikes started easily and ran fine. One thing to check is the chain tension. On the 2 smaller bikes the chains were too tight and needed to be adjusted so they did not put pressure on the front sprocket as the suspension compressed. Some people like to bash Chinese stuff, but the quality of these machines is impressive. I wanted bikes to trail ride with my 2 grandson's and didn't want to spend $10,000+ on 3 new bikes or $$? on used, beat up bikes. These bikes fulfilled all my requirements easily. I definitely will be buying from Power Sports Max again. My wife liked the 250cc so much she wants me to order a couple more just to have when the grand kids grow into them. One side note. I don't know if Power Sports Max uses the same carrier every time, but R&L trucking was awesome also. Will recommend to friends for sure! Bike arrived quicker than I expected, and delivery service was excellent. The bike was fairly easy assemble, and the quality was surprisingly better than I anticipated for the price. Started right up and after the whole "break in" process it performs great! Also powersports tech support answers quick, and will help with any concern. Overall very happy. Honestly I was suprised with the quality of this bike. I ordered this Sep 2018 and it was delivered to my house within 7 days. No problems with it at all. Runs great and it's fun to ride with friends. Would definitely recommend this bike! Very nice and my son loved it for his 16 birthday! Pleasantly surprised by the quality of this bike, especially considering what the cost is. Was a bit nervous when first ordering the bike but all concerns were alleviated rather quickly once the bike arrived. Bike was shipped in a Very rugged crate that was more than adequate to protect the bike on it's journey to Maine. Was not a big deal to put the bike together as the instructions were quite adequate to enable a novice such as me to put it together comfortably. I would definitely recommend using Loctite when using the supplied nuts and bolts as that is most definitely the one thing that has come loose on both bikes that were purchased for Xmas. Bike is very sturdy, quick and a ton of fun. Bikes sit very high, I am 6ft tall and I am stretched to my max reaching the ground. My sons bike I needed to get a shorter rear shock for him so that he could safely place his feet on the ground. For the cost you can't go wrong here. Stay on top of your basic maintenance and you will get plenty of fun from your new toy. Other than a few very minor issues I highly recommend this bike. PowersportsMax has been wonderful to deal with. Any questions were answered in a very timely manner by a very friendly and knowledgeable staff. They handled a special request that I had when the bike was scheduled to arrive and never thought twice about it. Extremely accommodating to say the least. Would definitely recommend PowersportsMax as the place to go for your new addiction!! I love my dirt bike will will provide many hour of fun for my sons and I.